The start of construction on St George Community Housing’s first affordable housing development in Sutherland demonstrates positive leadership, says the Urban Taskforce. 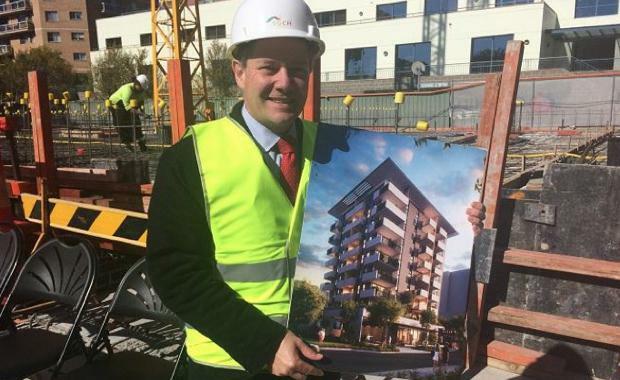 “At today’s ceremony to celebrate the commencement of construction of the $25 million affordable housing development in Sutherland it was clear that St George Community Housing are demonstrating leadership and innovation in the affordable housing industry,” said Urban Taskforce CEO, Chris Johnson. “The 9 storey building is well located near the local council library and close to Sutherland’s shops. The 46-unit complex will provide a range of one, two and three bedroom units along with resident common facilities. These will be leased to low-to-moderate income earners. “St George Community Housing are planning to develop 275 affordable and social housing dwellings across the Sydney Metropolitan area in the next 3 years with the support of a debt facility from Westpac. Westpac indicated at the construction ceremony that they are committed to making up to $2 billion available for investment in social and affordable housing. “With the increasing cost of housing in Sydney, the Urban Taskforce believes leadership innovation and collaboration, similar to this approach by St George Community Housing and Westpac is very important. We also believe that government owned land in Metropolitan Sydney could be contributed to affordable housing development. Rather than selling this land at the maximum profit it should be sold with the requirement that a reasonable number of dwellings are affordable.